Irish farmers take note! As it’s show season and your hard work for the year could pay off at your local show, now could be the time to ask the love of your life for his/her hand in marriage. 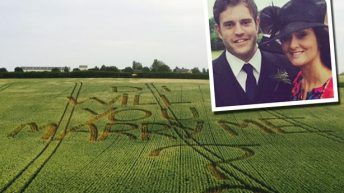 That’s exactly what one on farmer in the UK did when he put a red banner with the words ‘will you marry me’ on his Jersey cow at the recent Ashbourne Show in the UK. Alex Burrows asked Jo Stubbs for her hand in marriage in front of thousands of people during the grand parade of this year’s show, the Ashbourne News reports. Burrows then led Absorbine, the Jersey cow and reserve breed champion, out into the front of the ring to propose, it says. Jo told the paper that she saw him messing about with something but she couldn’t see what he was doing and then the next thing she saw he walked out into the front of the ring and turned round so I could see the writing. Jo was also a prize winner at this year’s show when her cow Josephine won breed champion of the year. Alex, an agricultural contractor with his own business the paper says, said Ashbourne Show always felt like the right time to propose to Jo. “I know how much Ashbourne Show means to Jo and her family. Farming is in their history and to do it at the show just seemed right. “Ashbourne Show is the epitome of Jo. She loves farming and her cows mean everything to her, so I knew proposing at the show would be the be-all and end-all for her,” he said. Jo said that she can’t believe how many comments they’ve had since the proposal; how many people have come up to them, even people we’ve never met. It’s gone mental. I felt a bit overwhelmed with all the people that have come and congratulated us. The proposal came at the end of the day with the hard work of getting the cow ready keeping his nerves at bay. “It was only really when we’d finished all the classes and the grand parade actually started that I started feeling nervous. “The nerves really did kick in and I just remember hoping everything would work as I’d planned it but in the end it couldn’t have gone any better. “I hope people will remember it happening and it will always be in our memories because we’ll always be involved with Ashbourne Show,” he told the Ashbourne News.